Bli kjent med Cotswolds på en dagstur som er satt opp bare for vintermånedene. Å presentere deg til severdighetene som er best sett under det kaldere været, setter turen på søkelyset på de sjarmerende stein landsbyene som regionen er elsket av. Beundre stråtakene og bølgende åser rundt Asthall, Swinbrook og Bourton-on-the-Water - den såkalte Venice Cotswolds. På vei tilbake til Oxford, vil du nyte ytterligere stopp ved Moreton-in-Marsh og Woodstock med sine lenker til Sir Winston Churchill. Travelling is always hectic when done with a toddler. After losing our way in Paddington Station we arrived late in Oxford station. Luckily we were the only people on the tour and Isobel and David kindly waited for us to arrive. From then on it was a smooth, pleasant and effortless day. We were picked up at the train station in a comfortable touring minivan. This was an important factor as they are able to get into villages where the bigger touring buses cannot get into. Our hosts were very knowledgeable and helpful and the tour was tailored according to our requests. If you want to spend more time in a certain village, you can. Stop for a quick photo on the side of the road, no problem. Isobel kept our attention with interesting stories and information on the area throughout the day. 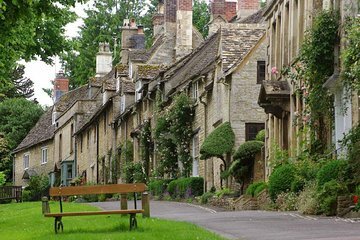 Definitely worth it if you want an unforgettable Cotswold experience. We will be back and have already recommended it to friends.